The Boxster/Cayman/Carrera platform has a tendency to overwork and overheat the Power Steering pump to the point that some of the lines and even plastic fluid reservoir have been known to melt! Cars that are Autocrossed or Tracked suffer the most from this malady. One of the simplest and most effective solutions is to install a smaller crankshaft pulley known as an <strong>underdrive pulley</strong>, because it underdrives the secondary systems (A/C, Alternator and Power Steering). There are no negative issues with cooling, charging or steering, but there’s an upside: the engine will regain back about 5-7 HP! TRS Motorsports 4 inch under drive crankshaft pulley kit includes pulley, drive belt (with or without A/C) and new bolt. 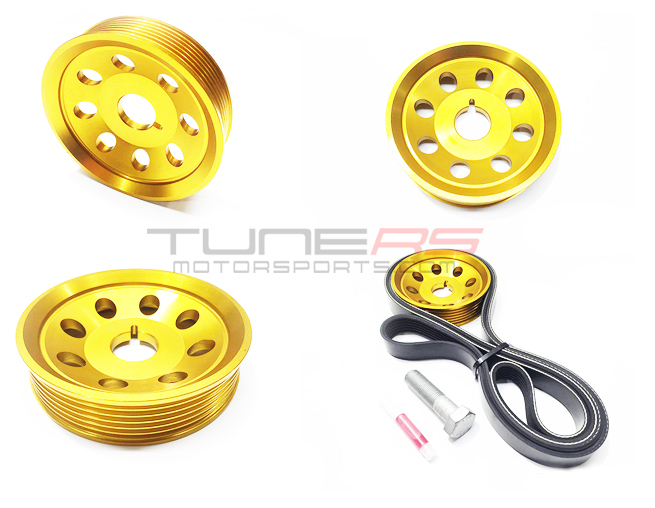 Our pulley is CNC machined from 6061-T6 aluminum and is anodized gold. Updating your car with our under drive pulley improves horsepower and torque while reducing parasitic drag from the alternator, power steering pump and water pump. Moreover, our pulley is also Spec Boxster legal. Will not fit Turbo / GT2 / GT3, DFI or 997 Carrera S 3.8L models! Proudly manufactured here in the USA with a lifetime manufacture defect warranty. While we provide step by step instructions for installing the under drive pulley on your Porsche we suggest you consider whether you are equipped with the appropriate tools, time and mechanical inclination before taking on this project yourself. Some of our clients have performed this service themselves and we have complete faith in our customers. We encourage you to carefully review our installation guide first. If you are not sure about whether you can handle this yourself then we highly recommend you contact us at 954-345-7877 to make an appointment. If you are not anywhere near our facility in Coral Springs Florida and can not transport your car to us then we highly recommend you visit our list of reputable independent TRS installers and distributors.